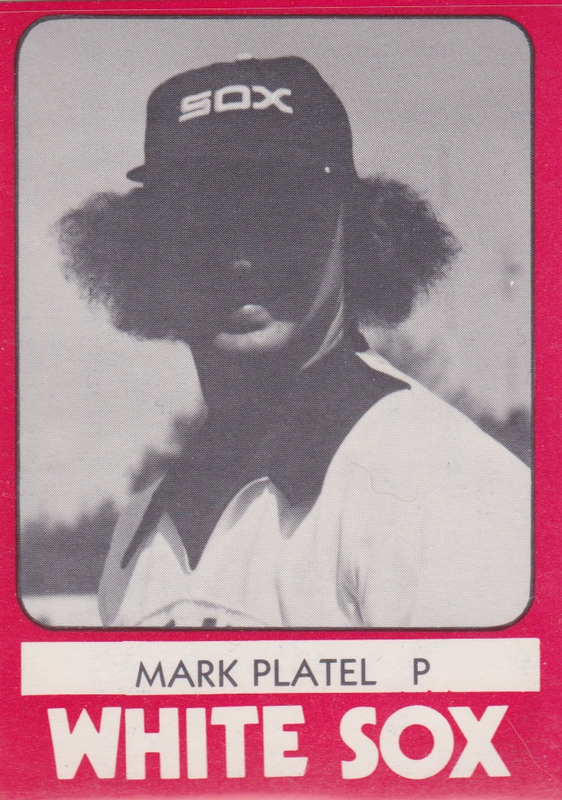 I'll take TCMA's word for it that this is Mark Platel. Could be any 1970s guy with that hair. Seeing that Mark stood a basketballish 6'5" led to the discovery that you can sort Baseball-Reference rosters by height, weight, date of birth, and so on. Doing this with Glens Falls shows that Platel tied for "Tallest 1980 White Sock" with Len Bradley and Richard Weiters. Color me surprised Glens Falls generated two different 1980 sets, given that season's mediocre 63-74 record. Perhaps the Sox ordered another in full-color (type profile to come) when this black-and-white version obscured almost all player faces with high-noon shadows. TCMA pictured 29 Glens Falls players, managers, and team staff in this set, with those in bold reaching the bigs. Value: This #5 cost $2 at MinorLeagueSingles.com. The presence of HOF hitting instructor Orlando Cepeda pushes the team set up a bit to $20-25. 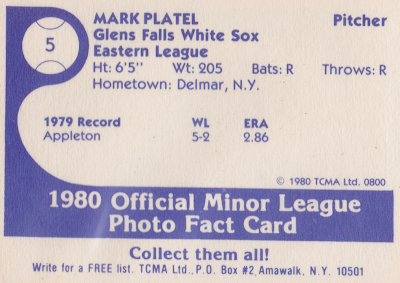 Fakes / reprints: TCMA reprinted several of their team sets for "collectors kits" later in the 80s. Originals use blue ink on the back and those reprints have black.